This article is about listed buildings in the United Kingdom. For equivalent listed structures in other jurisdictions, see List of heritage registers. A listed building, or listed structure, is one that has been placed on one of the four statutory lists maintained by Historic England in England, Historic Environment Scotland in Scotland, Cadw in Wales, and the Northern Ireland Environment Agency in Northern Ireland. The term has also been used in Ireland, where buildings are surveyed for the National Inventory of Architectural Heritage in accordance with the country's obligations under the Granada Convention. However, the preferred term in Ireland is protected structure. A listed building may not be demolished, extended, or altered without special permission from the local planning authority, which typically consults the relevant central government agency, particularly for significant alterations to the more notable listed buildings. In England and Wales, a national amenity society must be notified of any work to a listed building which involves any element of demolition. Exemption from secular listed building control is provided for some buildings in current use for worship, but only in cases where the relevant religious organisation operates its own equivalent permissions procedure. Owners of listed buildings are, in some circumstances, compelled to repair and maintain them and can face criminal prosecution if they fail to do so or if they perform unauthorised alterations. When alterations are permitted, or when listed buildings are repaired or maintained, the owners are often required to use specific materials or techniques. Although most sites appearing on the lists are buildings, other structures such as bridges, monuments, sculptures, war memorials, and even milestones and mileposts and The Beatles' Abbey Road pedestrian crossing are also listed. Ancient, military, and uninhabited structures, such as Stonehenge, are sometimes instead classified as scheduled monuments and protected by much older legislation, whilst cultural landscapes such as parks and gardens are currently "listed" on a non-statutory basis. Although a limited number of 'ancient monuments' were given protection under the Ancient Monuments Protection Act 1882, there was reluctance to restrict the owners of occupied buildings in what they could do to their property. It was the damage to buildings caused by German bombing during World War II that prompted the first listing of buildings that were deemed to be of particular architectural merit. Three hundred members of the Royal Institute of British Architects and the Society for the Protection of Ancient Buildings were dispatched to prepare the list under the supervision of the Inspectorate of Ancient Monuments, with funding from the Treasury. The listings were used as a means of determining whether a particular building should be rebuilt if it was damaged by bombing, with varying degrees of success. In Scotland the process slightly predated the war with the Marquess of Bute (in his connections to the National Trust for Scotland) commissioning the architect Ian Lindsay in September 1936 to survey 103 towns and villages based on an Amsterdam model using three categories (A, B and C). The basis of the current more comprehensive listing process was developed from the wartime system and was enacted by a provision in the Town and Country Planning Act 1947 covering England and Wales, and the Town and Country Planning (Scotland) Act 1947 covering Scotland. Listing was first introduced into Northern Ireland under the Planning (Northern Ireland) Order 1972. The listing process has since developed slightly differently in each part of the UK. In the UK, the process of protecting the built historic environment (i.e. getting a heritage asset legally protected) is called ‘designation’. To complicate things, several different terms are used because the processes use separate legislation: buildings are ‘listed’; ancient monuments are ‘scheduled’, wrecks are ‘protected’, and battlefields, gardens and parks are ‘registered’. A heritage asset is a part of the historic environment that is valued because of its historic, archaeological, architectural or artistic interest. Only some of these are judged to be important enough to have extra legal protection through designation. However, buildings that are not formally listed but still judged as being of heritage interest are still regarded as being a material consideration in the planning process. As a very rough guide, listed buildings are structures considered of special architectural and historical importance whereas ancient monuments are of 'national importance' containing evidential values and can on many occasions also relate to below ground or unoccupied sites and buildings. Almost anything can be listed – it does not have to be a building. Buildings and structures of special historic interest come in a wide variety of forms and types, ranging from telephone boxes and road signs, to castles. Historic England has created twenty broad categories of structures, and published selection guides for each one to aid with assessing buildings and structures. These include historical overviews and describe the special considerations for listing each category. Both Historic Scotland and Cadw produce guidance for owners. In England, to have a building considered for listing or delisting, the process is to apply to the secretary of state; this can be done by submitting an application form online to Historic England. The applicant does not need to be the owner of the building to apply for it to be listed. Full information including application form guidance notes are on the Historic England website. Historic England assesses buildings put forward for listing or delisting and provides advice to the Secretary of State on the architectural and historic interest. The Secretary of State, who may seek additional advice from others, then decides whether or not to list or delist the building. For lists of buildings, see Listed buildings in England and Listed buildings in Wales. In England and Wales the authority for listing is granted to the Secretary of State by the Planning (Listed Buildings and Conservation Areas) Act 1990. Listed buildings in danger of decay are listed on the Historic England 'Heritage at Risk' Register. In 1980 there was public outcry at the sudden destruction of the art deco Firestone Tyre Factory (Wallis, Gilbert and Partners, 1928–29), which was demolished over the August bank holiday weekend by its owners Trafalgar House who had been told that it was likely to be 'spot-listed' a few days later, and the Government undertook to review arrangements for listing buildings. After the Firestone demolition, the Secretary of State for the Environment Michael Heseltine also initiated a complete re-survey of buildings to ensure that everything that merited preservation was on the lists. In England, the Department for Culture, Media and Sport (DCMS) works with Historic England (an agency of the DCMS), and other government departments, e.g. Department for Communities and Local Government (DCLG) and the Department for the Environment, Food and Rural Affairs (DEFRA) to deliver the government policy on the protection to historic buildings and other heritage assets. The decision about whether or not to list a building is made by the Secretary of State, although the process is administered in England by Historic England. In Wales (where it is a devolved issue) it is administered by Cadw on behalf of the National Assembly for Wales and in Scotland it is administered by Historic Scotland on behalf of the Scottish Ministers. There have been several attempts to simplify the heritage planning process for listed buildings in England, which has still (as of May 2011) to reach a conclusion. The review process was started in 2000 by Alan Howarth, then minister at the Department for Culture, Media and Sport (DCMS). The outcome was the paper 'The Power of Place' in 2000 followed by the subsequent policy document 'The Historic Environment: A Force for Our Future' published by the DCMS and the Department of the Environment, Transport and the Regions (DTLR) in December 2001. The launch of the Government's Heritage Protection Reform (HPR) report in July 2003 by the DCMS entitled: 'Protecting our historic environment: Making the system work better', asked questions about how the current designation systems could be improved. The HPR decision report 'Review of Heritage Protection: The Way Forward' green paper published in June 2004 by the DCMS committed the UK government and English Heritage to a process of reform including a review of the criteria used for listing buildings. The Government also began a process of consultation on changes to Planning Policy Guidance 15 (PPG 15) relating to the principles of selection for listing buildings in England. After several years of consultation with heritage groups, charities, planning authorities and English Heritage, this eventually resulted in the publication of Planning Publication Statement 5 'Planning for the Historic Environment' in March 2010 by the DCLG. This replaced PPG15 and sets out the government's national policies on the conservation of the historic environment for the England. PPS5 is supported by a Practice Guide, endorsed by the DCLG, the DCMS, and English Heritage, which describes how to apply the policies stated in PPS5. The government's White Paper 'Heritage Protection for the 21st Century' published on 8 March 2007 offered a commitment to sharing the understanding of the historic environment and more openness in the process of designation. In 2008, a draft Heritage Protection Bill was subject to pre-legislative scrutiny before its passage through UK Parliament. The legislation was abandoned despite strong cross-party support, to make room in the parliamentary legislative programme for measures to deal with the credit crunch, though it may be revived in future. The proposal was that the existing registers of buildings, parks and gardens, archaeology and battlefields, maritime wrecks, and World Heritage Sites be merged into a single online register that will "explain what is special and why". English Heritage would become directly responsible for identifying historic assets in England and there would be wider consultation with the public and asset owners, and new rights of appeal. There would have been streamlined systems for granting consent for work on historic assets. Grade II: buildings that are of special interest, warranting every effort to preserve them. There was formerly a non-statutory Grade III, which was abolished in 1970. Additionally, Grades A, B and C were used mainly for Anglican churches in use – these correspond approximately to Grades I, II* and II. These grades were used mainly before 1977, although a few buildings are still listed using these grades. Listed buildings account for about 2% of English building stock. In March 2010, there were about 374,000 list entries of which 92% were Grade II, 5.5% were Grade II*, and 2.5% were Grade I. Places of worship play an important role in the UK's architectural heritage. England alone has 14,500 listed places of worship (4,000 Grade I, 4,500 Grade II* and 6,000 Grade II). 45% of all Grade I listed buildings are places of worship. Some of the listed churches are no longer in active use; between 1969 and 2010, some 1795 churches were closed by the Church of England, equaling roughly 11% of the stock, with about a third Listed as Grade I or II. There are estimated to be about 500,000 actual buildings listed, as listing entries can apply to more than one building. The criteria for listing include architectural interest, historic interest and close historical associations with significant people or events. Buildings not individually noteworthy may still be listed if they form part of a group that is—for example, all the buildings in a square. This is called 'group value'. Sometimes large areas comprising many buildings may not justify listing but receive the looser protection of designation as a conservation area. Age and rarity: The older a building is, the more likely it is to be listed. All buildings erected before 1700 that "contain a significant proportion of their original fabric" will be listed. Most buildings built between 1700 and 1840 are listed. After 1840 more selection is exercised and "particularly careful selection" is applied after 1945. Buildings less than 30 years old are rarely listed unless they are of outstanding quality and under threat. Aesthetic merits: i.e. the appearance of a building. However, buildings that have little visual appeal may be listed on grounds of representing particular aspects of social or economic history. Selectivity: where a large number of buildings of a similar type survive, the policy is only to list the most representative or significant examples. National interest: significant or distinctive regional buildings; e.g. those that represent a nationally important but localised industry. The state of repair of a building is not deemed to be a relevant consideration for listing. Any buildings or structures constructed before 1 July 1948 that fall within the curtilage of a listed building are treated as part of the listed building. The effect of a proposed development on the setting of a listed building is a material consideration in determining a planning application. Setting is defined as "the surroundings in which a heritage is experienced". Although the decision to list a building may be made on the basis of the architectural or historic interest of one small part of the building, the listing protection nevertheless applies to the whole building. Listing applies not just to the exterior fabric of the building itself, but also to the interior, fixtures, fittings, and objects within the curtilage of the building even if they are not fixed. De-listing is possible but rare in practice. One example is the 30 November 2001 de-listing of North Corporation Primary School, Liverpool. In an emergency, the local planning authority can serve a temporary listed "building preservation notice", if a building is in danger of demolition or alteration in such a way that might affect its historic character. This remains in force for 6 months until the Secretary of State decides whether or not to formally list the building. Until the passing of the Enterprise and Regulatory Reform Act in 2013 an application for a Certificate of Immunity from Listing could only be made if planning permission was being sought or had been obtained in England. However, the changes brought about by the Act means that now anyone can ask the Secretary of State to issue a Certificate of Immunity (CoI) in respect of a particular building at any time. In England and Wales, the management of listed buildings is the responsibility of local planning authorities and the Department for Communities and Local Government (i.e., not DCMS, which originally listed the building). There is a general principle that listed buildings are put to 'appropriate and viable use' and recognition that this may involve the re-use and modification of the building. However, listed buildings cannot be modified without first obtaining Listed Building Consent through the relevant local planning authority. In Wales, applications are made using a form obtained from the relevant local authority. There is no provision for consent to be granted in outline. When a local authority is disposed to grant listed building consent, it must first notify the National Assembly (i.e. Cadw) of the application. If the planning authority decides to refuse consent, it may do so without any reference to Cadw. In Scotland, applications are made on a form obtained from Historic Scotland. After consulting the local planning authority, the owner, where possible, and an independent third party, Historic Scotland makes a recommendation on behalf of the Scottish Ministers. Carrying out unauthorised works to a listed building is a criminal offence and owners can be prosecuted. A planning authority can also insist that all work undertaken without consent be reversed at the owner's expense. Buckingham Palace, the official London residence of the British monarch, listed Grade I.
Royal Festival Hall, London, was the first postwar building to gain Grade I listed status. 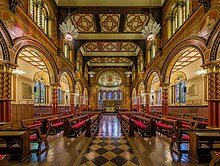 The Grade I listed King's College London Chapel on the Strand Campus was redesigned in 1864 by Sir George Gilbert Scott. See also Category:Grade I listed buildings for more examples of such buildings across England and Wales. The Bank Hall mansion house is a Grade II* listed building, due to the 17th-century clock tower, which features an original oak cantilevered staircase. 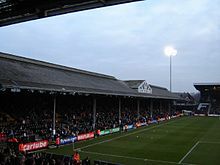 The Johnny Haynes stand at Craven Cottage is a Grade II* listed building. See also Category:Grade II* listed buildings for examples of such buildings across England and Wales. See also Category:Grade II listed buildings for examples of such buildings across England and Wales. In 2002, there were 80 seaside piers in England that were listed, variously at Grades I, II* and II. Golden Lane Estate, City of London, is an example of a site which includes buildings of different Grades, II and II*. Manor Farm, Ruislip, Middlesex, is made up of buildings that are both Grade II* (the Great Barn) and Grade II (the other buildings). Cobham Park, Kent, is a Listed Landscape (Humphry Repton and older landscape) containing both Grade I structures (Cobham Hall and Darnley Mausoleum) and Grade II structures (ornamental dairy etc.) as well as a scheduled monument (a buried Roman villa). West Norwood Cemetery is the first-ever[clarification needed] Gothic-designed cemetery and crematorium which contains 65 structures of Grade II or II*, mainly sepulchral monuments but also boundary structures and mausolea. Additionally it is listed Grade II* on the Register of Parks and Gardens. Derwent Valley Mills includes 838 listed buildings, made up of 16 Grade I, 42 Grade II*, and 780 Grade II. A further nine structures are scheduled monuments. Many councils, for example, Birmingham City Council and Crawley Borough Council, maintain a list of locally listed buildings as separate to the statutory list (and in addition to it). There is no statutory protection of a building or object on the local list but many receive a degree of protection from loss through being in a Conservation Area or through planning policy. Councils hope that owners will recognise the merits of their properties and keep them unaltered if at all possible. Grade A: This is of statutory list quality. To be the subject of notification to Historic England or the serving of a Building Preservation Notice if imminently threatened. Grade B: Important in the citywide architectural or local street scene context, warranting positive efforts to ensure retention. Grade C: Of significance in the local historical/vernacular context, including industrial archaeological features, and worthy of retention. Crawley Borough Council judges buildings on five criteria: historic interest, architectural interest, group and townscape value, intactness and communal value. As of November 2010, there were 59 buildings on its local list. For lists of buildings, see Listed buildings in Northern Ireland. Listing began later in Northern Ireland than in the rest of the UK: the first provision for listing was contained in the Planning (Northern Ireland) Order 1972; and the current legislative basis for listing is the Planning (Northern Ireland) Order 1991. Under Article 42 of the Order, the relevant Department of the Northern Ireland Executive is required to compile lists of buildings of "special architectural or historic interest". Since 2016, the responsibility for the listing process rests with the Historic Environment Division of the Department for Communities, which took over the built heritage functions of the Northern Ireland Environment Agency (formerly the Environment and Heritage Service) following the break up of the Department of the Environment. Following the introduction of listing, an initial survey of Northern Ireland's building stock was begun in 1974. By the time of the completion of this First Survey in 1994, the listing process had developed considerably, and it was therefore decided to embark upon a Second Survey, which is still ongoing, to update and cross-check the original information. Information gathered during this survey, relating to both listed and unlisted buildings, is entered into the publicly accessible Northern Ireland Buildings Database. Grade A: "buildings of greatest importance to Northern Ireland including both outstanding architectural set-pieces and the least altered examples of each representative style, period and type." Grade B+: "high quality buildings that because of exceptional features, interiors or environmental qualities are clearly above the general standard set by grade B1 buildings. Also buildings which might have merited Grade A status but for detracting features such as an incomplete design, lower quality additions or alterations." Grade B1: "good examples of a particular period or style. A degree of alteration or imperfection of design may be acceptable. Generally B1 is chosen for buildings that qualify for listing by virtue of a relatively wide selection of attributes. Usually these will include interior features or where one or more features are of exceptional quality and/or interest." Grade B2: "special buildings which meet the test of the legislation. A degree of alteration or imperfection of design may be acceptable. B2 is chosen for buildings that qualify for listing by virtue of only a few attributes. An example would be a building sited within a conservation area where the quality of its architectural appearance or interior raises it appreciably above the general standard of buildings within the conservation area." For lists of buildings, see Listed buildings in Scotland. The National Gallery of Scotland, Edinburgh, designed by William Henry Playfair, is a Category A listed building. In Scotland, listing was begun by a provision in the Town and Country Planning (Scotland) Act 1947, and the current legislative basis for listing is the Planning (Listed Buildings and Conservation Areas) (Scotland) Act 1997. As with other matters regarding planning, conservation is a power devolved to the Scottish Parliament and the Scottish Government. The authority for listing rests with Historic Environment Scotland (formerly Historic Scotland), an executive agency of the Scottish Government, which inherited this role from the Scottish Development Department in 1991. Listed building consent must be obtained from local authorities before any alteration to a listed structure. Category A: "buildings of national or international importance, either architectural or historic, or fine little-altered examples of some particular period, style or building type." Category B: "buildings of regional or more than local importance, or major examples of some particular period, style or building type which may have been altered." Category C: "buildings of local importance, lesser examples of any period, style, or building type, as originally constructed or moderately altered; and simple traditional buildings which group well with others in categories A and B." There are about 47,400 listed buildings in Scotland. Of these, around 8 percent (some 3,800) are Category A, and 50 percent are Category B, with the rest listed at Category C.
The main stand of Ibrox Stadium, the home of Rangers F.C., is a Category B listed building. Although the 2008 draft legislation was abandoned, English Heritage published a single list of all designated heritage assets within England in 2011. The National Heritage List for England is an online searchable database which includes 400,000 (most but not all) of England's listed buildings, scheduled monuments, registered parks and gardens, protected historic wrecks and registered battlefields in one place. The legislative frameworks for each type of historic asset remains unchanged (2011). In Scotland, the national dataset of listed buildings and other heritage assets can be searched online via Historic Scotland, or through the map database Pastmap. To find a listed building in Wales, it is necessary to contact the appropriate local authority or Cadw. Also British Listed Buildings (website) has sections on England, Wales and Scotland. It can be searched either by browsing for listed buildings by country, county and parish/locality, or by keyword search or via the online map. Not all buildings have photographs, as it is run on a volunteer basis. The Northern Ireland Buildings Database contains details of all listed buildings in Northern Ireland. A photographic library of English listed buildings was started in 1999 as a snapshot of buildings listed at the turn of the millennium. This is not an up-to-date record of all listed buildings in England – the listing status and descriptions are only correct as at February 2001. The photographs were taken between 1999 and 2008. It is maintained by the Historic England archive at the Images of England project website. The National Heritage List for England contains the up-to-date list of listed buildings. Listed buildings in danger of being lost through damage or decay in England started to be recorded by survey in 1991. This was extended in 1998 with the publication of Historic England's Buildings at Risk Register which surveyed Grade I and Grade II* buildings. In 2008 this survey was renamed Heritage at Risk and extended to include all listed buildings, scheduled monuments, registered parks and gardens, registered battlefields, protected wreck sites and conservation areas. The register is compiled by survey using information from local authorities, official and voluntary heritage groups and the general public. It is possible to search this list online. In Scotland, a buildings at risk register was started in 1990 by Historic Scotland in response to similar concerns at the number of listed buildings that were vacant and in disrepair. RCAHMS maintain the register on behalf of Historic Scotland, and provide information on properties of architectural or historic merit throughout the country that are considered to be at risk. In Wales, at risk registers of listed buildings are compiled by local planning authorities, and Cadw produced a report in 2009. The Royal Commission on the Ancient and Historical Monuments of Wales's (RCAHMW) Emergency Buildings Recording team is responsible for surveying historic buildings threatened with destruction, substantial alteration, or serious decay. Japan – Tangible Cultural Property (Japan), Groups of Traditional Buildings. For other countries' equivalents see List of heritage registers. ^ "Buildings of Ireland". Retrieved 14 August 2012. ^ "Arrangements for handling heritage applications Direction 2015 - Publications - GOV.UK". ^ "Listing FAQs". 1st Associated Ltd. Retrieved 2 June 2016. ^ "The unusual buildings granted listed status". The Daily Telegraph. 8 June 2011. Retrieved 9 June 2011. ^ "Preserving historic sites and buildings". Parliament.uk. Archived from the original on 23 April 2010. Retrieved 27 August 2010. ^ a b "Listed buildings - The Victorian Society". Archived from the original on 7 December 2009. Retrieved 9 January 2010. ^ a b "Targets of enemy bombers and our own demolition men". 28 August 1995. ^ "Protecting the Historic Environment". Department of Culture, Media and Sport. Retrieved 7 June 2011. ^ a b c d e "Planning policy Statement 5 'Planning for the Historic Environment'". Department of Communities and Local Government. March 2010. Archived from the original on 18 January 2017. Retrieved 9 August 2012. ^ "Planning (Listed Buildings and Conservation Areas) Act 1990". HM Government. June 1990. Retrieved 7 June 2011. ^ "Selection Guildlines". English Heritage. Retrieved 8 June 2011. ^ a b "Listed Buildings FAQs". Wiltshire Council. Retrieved 8 June 2011. ^ "Buildings & Conservation Areas". cadw.gov.wales. ^ John Witherow, "No listing of Hoover factory", The Times, 1 September 1980, p. 4. ^ John Young, "A notable dozen are added to the nation's listed buildings", The Times, 15 October 1980, p. 4. ^ Charles Knevitt, "Protecting palaces and pillarboxes", The Times, 3 June 1985, p. 8. ^ a b "Listing Buildings". Department of Culture, Media and Sport. Retrieved 6 June 2011. ^ "Listed Buildings in Wales". Cadw. Archived from the original on 3 December 2010. Retrieved 7 June 2011. ^ "The Listing Process". Historic Scotland. Retrieved 7 June 2011. ^ John Sharland (2006). "Listed Buildings and the Historic Environment – A Critique of the Government's Review of Heritage Policy'". Retrieved 23 May 2011. ^ "The Power of Place" (pdf). 2000. Retrieved 23 May 2011. ^ "The Historic Environment: A Force for our Future". 2001. Archived from the original on 12 May 2010. Retrieved 7 June 2011. ^ "Protecting our Historic Environment: Making the System Work Better". 2003. Archived from the original on 12 May 2010. Retrieved 7 June 2011. ^ "Selection Guidelines". English Heritage. Retrieved 7 June 2011. ^ "Draft Heritage Protection Bill" (.pdf). Department of Culture, Media and Sport. April 2009. Retrieved 4 March 2016. ^ Roger Mascall (18 December 2009). "The Heritage Protection Bill Fundamental reform for England and Wales?". Retrieved 7 June 2011. ^ "Heritage Protection Reform – Draft Heritage Protection Bill". English Heritage. 2 April 2008. Archived from the original on 9 April 2008. Retrieved 6 May 2014. ^ "Principles of Selection for Listing Buildings" (PDF). Department of Culture, Media and Sport. March 2010. Archived from the original (.pdf) on 4 December 2012. Retrieved 24 May 2011. ^ "Listed Buildings". English Heritage. Retrieved 16 July 2018. ^ "About Listed Buildings". Heritage.co.uk. Archived from the original on 26 October 2005. ^ "Heritage at Risk Report" (.pdf). English Heritage. July 2010. Retrieved 6 June 2011. ^ "Listed Buildings". English Heritage. Archived from the original on 24 January 2013. Retrieved 7 June 2011. ^ "Caring for Places of Worship". British Religion in Numbers. Retrieved 24 May 2011. ^ "CHURCHES AND CLOSURE IN THE CHURCH OF ENGLAND : A Summary Report" (PDF). Theheritagealliance.org.uk. Retrieved 3 February 2019. ^ a b "Principles of Selection for Listing Buildings" (PDF). Department of Media, Culture and Sport. March 2010. Archived from the original (.pdf) on 4 December 2012. Retrieved 25 May 2011. ^ Planning (Listed Buildings and Conservation Areas) Act 1990, Part 1, Chapter 1, Section 5(a). ^ a b Noted as 'Changes to legislation: There are outstanding changes not yet made by the legislation.gov.uk editorial team to Planning (Listed Buildings and Conservation Areas) Act 1990.' "Planning (Listed Buildings and Conservation Areas) Act 1990: Listing of buildings of special architectural or historic interest: Chapter 1, section 6". UK Government. Archived from the original on 19 March 2016. Retrieved 8 June 2011. ^ "Living in a Listed Building". English Heritage. Retrieved 3 September 2013. ^ "Listed Building Consent". Cadw. Archived from the original on 3 December 2010. Retrieved 8 June 2011. ^ "The Listing Process". Historic Scotland. Retrieved 8 June 2011. ^ a b Crawley Borough Council (November 2010). Crawley Local Building List (Report). Crawley Borough Council. Archived from the original on 9 February 2013. Retrieved 9 February 2013. ^ "Mussenden Temple: Historic Building Details". Northern Ireland Buildings Database. Department for Communities. Archived from the original on 11 February 2017. Retrieved 8 February 2017. ^ a b c d e f "Planning Policy Statement 6 Planning, Archaeology and the Built Heritage Revised Annex C: Criteria for Listing" (.pdf). DOENI. 2011. Retrieved 8 February 2017. ^ "Structure and Contents in the Historic Environment Division" (PDF). Department for Communities. December 2016. Archived from the original (PDF) on 5 January 2017. ^ "Changes to government departments". nidirect.gov. Retrieved 8 February 2017. ^ a b "Second Survey". Department for Communities. Retrieved 8 February 2017. ^ "Planning Policy Statement 6: Planning, Archaeology, and the Built Heritage" (.pdf). Planning Service. March 1999. p. 22. Retrieved 6 July 2010. ^ "Listed Buildings". Department for Communities. Retrieved 8 February 2017. ^ "Gosford Castle: Historic Building Details". Northern Ireland Buildings Database. Department for Communities. Archived from the original on 11 February 2017. Retrieved 8 February 2017. ^ "Grand Opera House: Historic Building Details". Northern Ireland Buildings Database. Department for Communities. Archived from the original on 11 February 2017. Retrieved 8 February 2017. ^ "National Gallery of Scotland: Listed Building Report". Historic Scotland. Retrieved 6 July 2010. ^ a b Scottish Historic Environment Policy (.pdf). Historic Scotland. October 2008. pp. 24–25. ISBN 978-1-84917-002-4. Retrieved 6 July 2010. ^ a b c "What is Listing?". Historic Scotland. Retrieved 6 July 2010. ^ 3 Categories of listed building. Historic Environment Scotland. Retrieved 6 March 2017. ^ "Ibrox Stadium: Listed Building Report". Historic Scotland. Retrieved 6 July 2010. ^ "Craigellachie, Old Bridge: Listed Building Report". Historic Scotland. Retrieved 7 July 2010. ^ "Glasgow City Chambers: Listed Building Report". Historic Scotland. Retrieved 6 July 2010. ^ "Glasgow Cathedral, excluding scheduled monument SM90150". Historic Environment Scotland. Retrieved 31 July 2017. ^ "Palace of Holyroodhouse: Listed Building Report". Historic Scotland. Retrieved 6 July 2010. ^ "Ravelston Garden, nos. 1–48: Listed Building Report". Historic Scotland. Retrieved 6 July 2010. ^ "Cardross Kilmahew Estate, St. Peter's College". Historic Scotland. Retrieved 11 May 2017. ^ "Harbour House: Listed Building Report". Historic Scotland. Retrieved 6 July 2010. ^ "National War Museum of Scotland: Listed Building Report". Historic Scotland. Retrieved 6 July 2010. ^ "Ostaig Farm Square known as Sabhal Mor Ostaig: Listed Building Report". Historic Scotland. Retrieved 6 July 2010. ^ "Cathedral of St John The Divine (Episcopal): Listed Building Report". Historic Scotland. Retrieved 6 July 2010. ^ "The Belmont Picturehouse: Listed Building Report". Historic Scotland. Retrieved 6 July 2010. ^ "Craigend Castle: Listed Building Report". Historic Scotland. Retrieved 6 July 2010. ^ The Historical Association. "The National Heritage List for England has gone live". Archived from the original on 28 September 2011. Retrieved 23 May 2011. ^ a b "The National Heritage List for England". English Heritage. Archived from the original on 1 May 2012. Retrieved 23 May 2011. ^ "Historic and Listed Buildings". Historic Scotland. Retrieved 7 June 2011. ^ Good Stuff IT Services. "Listed Buildings Online". British Listed Buildings. Retrieved 15 August 2012. ^ "Northern Ireland Buildings Database". Northern Ireland Environment Agency. Archived from the original on 12 May 2011. Retrieved 7 June 2011. ^ "Images of England FAQs". English Heritage. Retrieved 8 June 2011. ^ "Buildings at Risk". English Heritage. Retrieved 24 May 2011. ^ "What is Heritage at Risk?". Helm. Retrieved 8 June 2011. ^ "Heritage at Risk". Archived from the original on 12 June 2011. Retrieved 24 May 2011. ^ "Buildings at Risk". Royal Commission on the Ancient and Historical Monuments of Scotland. Archived from the original on 17 July 2011. Retrieved 8 June 2011. ^ "Tackling Wales' buildings at risk". Cadw. 1 November 2009. Retrieved 8 June 2011. ^ "PROTECTED BUILDINGS AND REDEVELOPMENT AREAS IN GERMANY- AN OWNERS GUDE". Wikimedia Commons has media related to Listed buildings in the United Kingdom.